Airrane participated in Biogas Asia Pacific Forum 2018 in Sunway Putra Hotel, Kuala Lumpur, Malaysia from April 16 to 19, 2018. 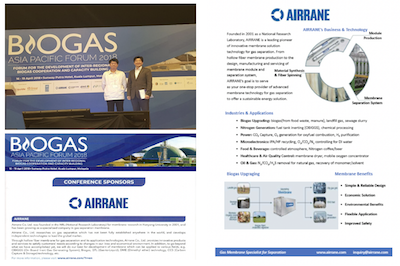 We supported Biogas Asia Pacific Forum 2018 as a conference sponsor and advertised Airrane membrane technologies and biogas upgrading benefits. We also exchanged recent biogas technology and market situation with participants from various countries.